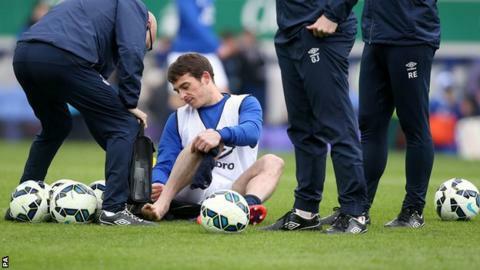 Defender Leighton Baines has been ruled out of Everton's last two Premier League games following ankle surgery. The left-back will also miss England's friendly against the Republic of Ireland on 7 June and their Euro 2016 qualifier with Slovenia a week later. Toffees boss Roberto Martinez revealed Baines, 30, had been struggling with the problem for the past three years. Martinez said: "He has had surgery. It was straightforward. He will be out until the start of pre-season." Baines, who has 30 England caps, was taken off injured during Everton's Premier League defeat by Sunderland last weekend. The Toffees travel to West Ham on Saturday (15:00 BST) before their final league match of the season, at home to Tottenham on 24 May.